Fact: I am scared of spiders. Seriously. Within two seconds of seeing a spider I go from being cool, calm and collected to a 'Price is Right' contestant on crack who's coming down from a bad trip. The other night I came home to discover a big huntsman spread eagled on the front door. I back flipped away from that front door so fast it was like I was Neo from 'The Matrix'. I stared at that spider (from a safe distance) and started to analyse myself. I tried to think logically about my fear. I mean, the spider is not out to get me (or is it ...), it's smaller than me, why do I let this massive small little monster creature freak me out so much? And COME ON, can any one blame me for being scared of something that is called a 'Hunts-MAN'. For the love of all that's holy, it HUNTS ... MEN! I don't think this is an irrational reaction! After fruitlessly throwing leaves at the spider from 20 metres away like a crazy person, I did what all rational, mentally healthy women would do. I waited outside for twenty minutes, in the cold and dark for my husband to come home. One of the places that I do like angular shapes and dark colours is sewing, though my recent dress is very 'anti-spider' with its many curves and friendly colours. Look at my belly grow! It looks like a small family is growing in there. My wonderful cousin Anthony married his beautiful bride Katherine in a moving ceremony three weeks ago. I knew I wanted to make a dress for the occasion, and I thought it would be a great way to really break me back into my sewing rhythm. 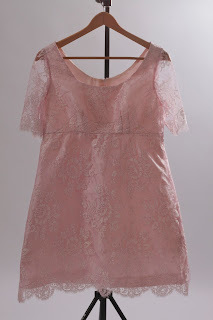 This is the dress that I made and wore to the wedding. 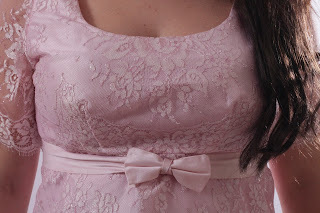 My husband took these photos of me in the dress a few days ago with my 23 week pregnant belly already bigger than it was three weeks ago at the wedding! My inspiration for this dress came from the fabulous Betty from Mad Men who rocked a very pretty dress in Season 3 Episode 3 of Mad Men. Photos curtesy of Tom and Lorenzo. I remember seeing this episode for the first time and falling in love with this dress. I thought Betty looked so fresh and innocent. Which is ironic as this is the occasion where she meets the man she would leave her husband for. Awkward. I thought this would be exactly the sort of fancy pantsy dress I would like to wear when I was pregnant one day. One fertilised egg later and this dress jumped back into my consciousness. And you all know I have a wee soft spot for Mad Men fashion. As you can see, my version looks quite a bit different from the picture on the packet, but the shape and silhouette has not been changed. To compensate for my fast expanding stomach and, let's be honest, my ever growing bosom (sorry dad!) I cut the dress in a pattern size 16. And shortened the bodice at the shoulders by 2 cm. I removed 4cm excess around the circumference of the empire waistline by enlarging the darts below the bust. I slightly gathered the top of the skirt so that the skirt fit the narrower bodice, while also giving extra room for the belly. 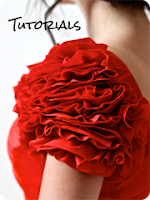 I made my own sleeves to go with the dress for a more evening look. 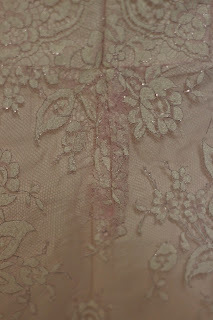 I purchased this stunning french lace at Stitches to Style and had to do some serious deep breathing before I cut into it at home. I made the EPIC mistake of telling my husband how much the lace cost per metre. What.Was.I.Thinking??!!! 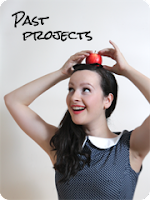 I blame this lack of secrecy on my new pregnant brain. What woman, chooses to disclose the price of LACE fabric for Petes sake! Every good fabric-holic understands that what their partner doesn't know won't hurt them. After my dear husband re-assembled his jaw (which has smashed unceremoniously as it had hit the floor) he recovered and was able to appreciate the beauty and value of the fabric, in an abstract sort of way. Look! It has shiny bits in it! 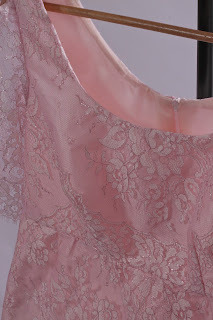 I underlined the lace in a beautiful silk dupion from Clegs. 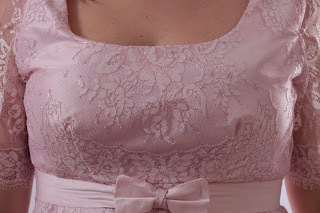 See my blog post here on how to underline lace. The dress is also fully lined and closed down the centre back with an invisible zipper. I spent hours matching up the patterns on the lace so that everything was centered and the scallop on the hem of the skirt and sleeves matched. My apologies for the lack of hook-and-eye, it has been fixed since these photos! Instead of putting a centre back seam in the skirt of the lace, I removed the seam allowance and cut it as one big piece. 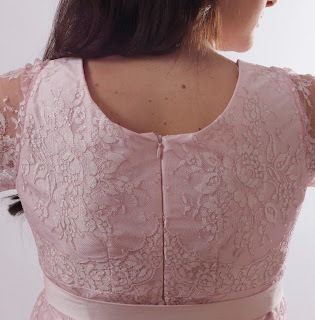 This meant that the pattern on the back of the lace wasn't interrupted by a big seam line. I made a placket at the top of the centre back seam on the skirt so that I'd still be able to get into the dress. I was really pleased with how it turned out, and my first ever placket! I made a cute little belt with a bow out of left over silk dupion. I cut the belt fabric on the bias and interlined it to strengthen it. The belt closes with two hook-and-eyes. My main accessory for the dress? Red lipstick (of course!) I had lots of lovely comments on the night, which made all my hard work worth it! Every time I sew with lace, I just want to make another ten more! So gorgeous! The lace is just divine and your dress is perfect! You look so adorable as usual but even more now you are pregnant. With regard to spiders I am absolutely petrified, and you have much bigger in Ausssie land. Think I would have a silent heart attach if I seen any of them lol. Thanks so much Sassy! I almost crashed my car once when I discovered a huntsmen on my windshield. I couldn't get into the car with out checking every inch of it for weeks afterwards! And huntsmen have a tendency to, sort of, jump :-S very disconcerting! Beautiful with a capital B, and the dress is stunning too! Stunning! 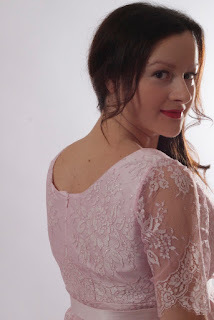 This is a great interpretation of the Mad Men dress :) There are indeed some fabrics that prices should not be mentioned- lace and cashmere (well, blends for me) are my big culprits... That's between me and my bank balance! Such a beautiful dress. It looks perfect on you. I AM insanely afraid of spiders too. Like I check my bed for them at night (completely irrational). The other day I was riding my bike to work and saw a spider 2 inches from my hand on the handlebar. Seriously, I almost killed myself in traffic from the braking and screeching and jumping off in the middle of the road. It was not elegant. Or safe. Point is, I empathize. I immediately recognised this as 'Betty's dress' as I've loved it since first seeing it. You look absolutely stunning in it, what a job well done! You and the bump are glowing my dear! You did an amazing job with this dress! You look so beautiful. This dress is a work of art! It is absolutely stunning, as are you. Congrats. The dress looks lovely as you. 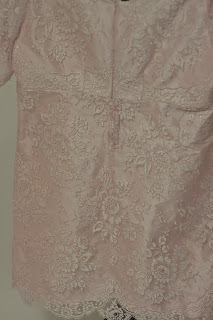 I don't think I want to make a lace dress. I tend to be careless. Patience with lace is not one of my virtue. BTW - I am not afraid of spiders. I don't scream in terror when I see them. I do get frightful when a big roach touch me. I panicked and screamed. Funnily, I also don't mind snakes - unless it is poisonous, then I be rather wary about them. OHMYGOD. You are the cutest pregnant wedding guest ever. Well done on the dress and CONGRATS! I haven't been reading blogs, so I didn't know you were expecting. Of course your maternity clothes are as amazing as your normal ones! So pretty. This is so beautiful! I LOVE it! You never fail to amaze me with your creations! I'm definitely with you on the spiders! They are the most terrifying things in the world! What a beautiful dress and a stunning pregnant wedding guest! Another masterpiece, Julia! Its beautiful! And you look absolutely stunning in it. Also - practically fell out of my chair when I clicked over to have a gander at that huntsman - wtf?!?!?! They breed em big in Australia!!! I'd backflip too if I came home to that! You are definitely pretty in pink! Wow this dress looks simply stunning! I really would never have guessed it was the same pattern as the pictures on the envelope. This is outstanding. When I was pregnant with my 3 maternity clothes were deeply unattractive. Your dress is stunning. Gorgeous! I actually just watched that episode of MM and thought the same thing about her dress! I have somehow missed all your posts for the last several months and didn't even know you were pregnant. So congratulations!!! The dress is really pretty and perfect for a wedding. I totally agree with you about spiders...ick...EEEK! What a beautiful dress! I don't tell my husband how much I spend on fabric either. I don't tell how much I spend on fabric. 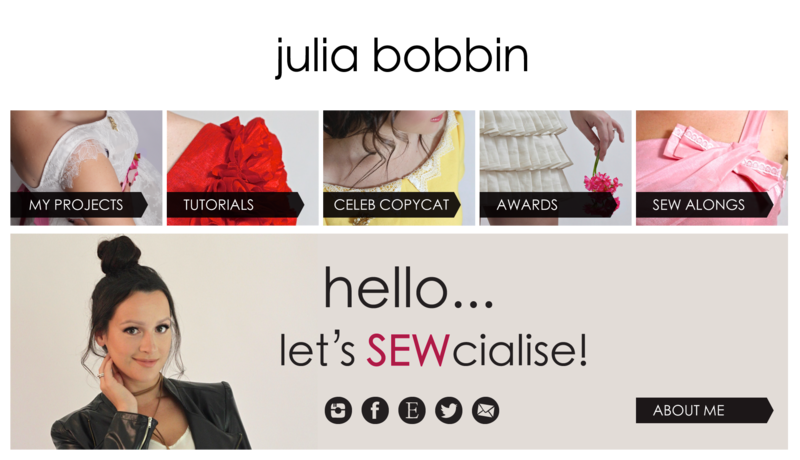 I should stop telling my husband how much I spend on sewing machines! Thanks for sharing. Gives me ideas for some fabric that will need underlining because it is so sheer. Sush a gorgeous dress! You look stunning! Wow you look so cute and pretty as always. Such a beautiful dress well done. I had a huntsman run across my car windscreen (inside my car) I nearly had a car crash it scared me so much hehe. 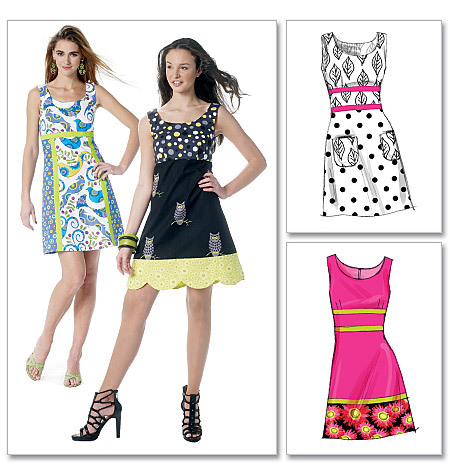 Gorgeous - you and the dress! That's such a gorgeous dress on you! Ha, I didn't even realize it was based on Mad Men until you put up the pictures - I don't know how I missed that! You have no idea how envious I am of your dress! Wish _I_ could have had something that beautiful when pregnant. Oh, and, I totally second you on the "don't tell the husband how much the fabric costs". 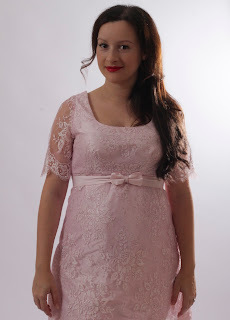 really looks great on you this lace dress!! cute bow at empire level! This is such a gorgeous dress and you look amazing in it! It's good to have you back. You inspired me to personalize my garments a bit more. 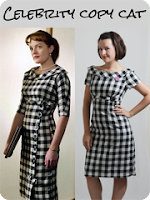 I'm going to make your Peggy dress after I finish the skirt I'm working on and I can't wait. You're amazing!!! I can't believe how much work you put into the dress, it really shows though. It is a work of art! I love this! so beautiful! 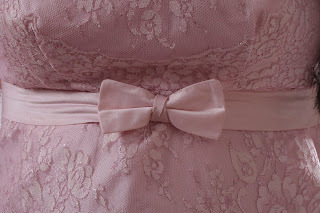 I can't imagine you having to lean over your bulging cute little stomach to match all the lace! you are too cute for words! your dress is just beautiful!!! great job!! I think you look even more lovely than the lovely Betty! Congratulations on the baby! That dress is beautiful! You did an outstanding job. So talented. Hahaha you made ma lol with what you wrote about your husband and the price of the lace! Uber cute!! And an even cuter dress-- it's absolutely dreamy in a cute way. 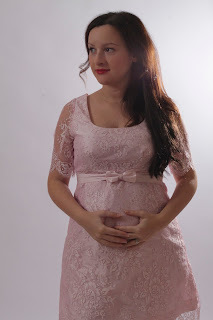 I hope to be able to rock such pretty frocks when I'm preggers next time! It's awesome to come across a blog every once in a while that isn't the same unwanted rehashed information.